While drivers in northern climates try to avoid black ice on the road, this Black Ice 1938 Chevy Business coupe street rod is the kind of ride no one would want to avoid, and this stunning street rod is up for sale if you’re looking to buy a street rod that really stands out. This ’38 street rod, named Black Ice according to the listing, has some incredible modifications, and it is a beautiful example of classic iron combined with modern technology. This one of a kind custom ride features all-wheel drive and is powered by a 4.3 Liter v-6 Syclone turbo charged, plus fuel injected, and intercooled engine, and it has a functional computer and emission control systems. Thanks to professional craftsmanship and obviously being a well cared for and maintained investment, this all-steel Chevy street rod is as much a piece of art as a it is a vehicle, and this show-stopper has been featured in Street Rodder magazine. 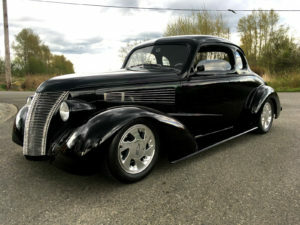 The seller notes that this 1938 Chevrolet Business Coupe street rod is a project that was completed in June 1993 and it took 205 man hours, plus a chunk of money, to create this amazing ride. The car has a lot more features that add to its value and the pleasure it would give its new owner, and rather than list each feature here, I invite you to click on the image to visit the eBay listing where this 1938 Chevy business coupe street rod is listed for sale. The seller offers, in the listing, to share more photos and even video footage of the car driving down the freeway, as well, so if you are looking for a street rod to buy, or if you just want to get a better look at this stunner, be sure to visit the listing and make contact with the seller on this amazing car. THIS, is the kind of Black Ice you want to encounter on the roads. Classic Cars Online US is proud to partner with eBay to bring you this information on the 1938 Chevrolet Business Coupe Street Rod by showing you the ’38 Chevy business coupe street rod for sale in the photo.